I didn’t see or hear a thing before I almost stepped right on the rattlesnake! There he was, about five feet away, backing slowly off but still facing me. 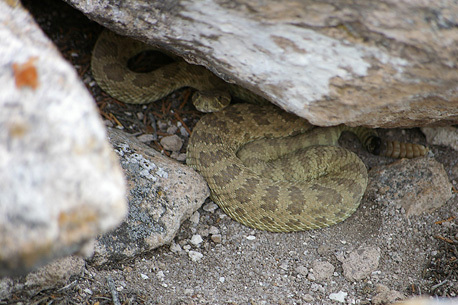 I took a step toward the reptile as I fumbled with my camera case, and he moved on a little farther to coil up under a small outcropping of rock. I wasn’t the least bit worried and couldn’t believe my luck. Deciding I could get a better image with a telephoto macro shot, I made a lens change that someone should have filmed and took my pictures. The snake stayed there the whole time. I told him, “Don’t be scared, little brother, don’t be scared,” and maybe he believed me. What a GIFT! I was so happy. They don’t make luckier men than me. The whole trip was a mad rush of desire from end to end. 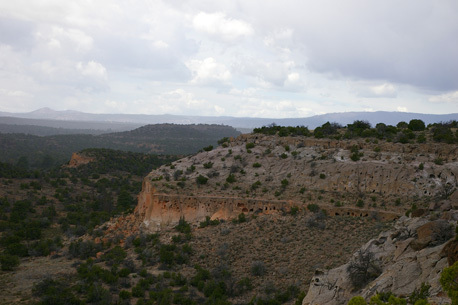 I’d read a story about Tsankawi [tsan-kah-WEE] back in March and knew I had to go: an unexcavated Pueblo settlement from the early 1400s on top of a mesa reached by climbing ladders and ancient footpaths worn into the rock? 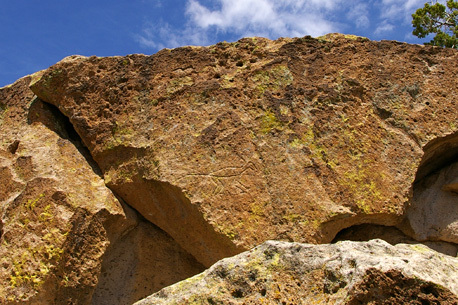 With cave dwellings and petroglyphs, less than 90 minutes away? Are you kidding? New Mexico is full of exciting things like this, but in my long career of self-inflicted punishment, these wonders were just something else to be denied–until I read about Tsankawi, and something finally snapped. When we finally got a few warm days, I declared that one of them was mine and I was going. Taking my camera, video recorder, lunch, a walking stick, and of course a great big knife, but going, then and there. Just me, no obligations, and only a rough itinerary. I was mildly anxious that the ’87 Ford F-150 with the big straight six might shred a belt or fry a fuel pump, but I filled both tanks and thundered off regardless. God, I love a road trip in the bright sun and cool, dry air! The truck ran fine, of course, outside of a few idiosyncracies of age. For instance, there’s an oil leak from the valve cover that drips a little onto the engine block and makes a stink. That, and double-clutching past a worn-out throwout bearing. (I live with these instead of monthly payments.) But the Ford is tough, with six-ply tires, and scared of nothing. A dented brute that likes to run. I took more risks, I saw so much. I went beyond Tsankawi, to an overlook above the Rio Grande that simply stunned me with its grandeur and no guard rails–one could step right out and fall 600 feet–then drove past Bandelier and cool green mountain forests, through weird Los Alamos, down-down-down to Española, and north back home to Taos, pretty much in shock. You’d think one might remember this more often than once or twice a year, you know? John your writing sizzles with excitement and energy….and I have envy, envy, envy……wish I had been there exploring too. What a lucky dude you are to live so close !!! just wrote on your blog…..envy has overcome me! What a great day, and thanks for sharing. Love the Story, the Message, and even “borrowed” your quote (but gave you credit) about being the River, NOT the swimmer….GREAT Philosophy! You have the world at your fingertips…and amazing stories and photos which we all enjoy….Keep ’em coming – and Stay SAFE!